Zara jumper, topshop skirt, Kendra Scott earrings, J.crew and vintage bracelets, Giuseppe Zanotti shoes. Pulled out my Zanottis for Thursday's beautiful weather. I was originally wearing a Red Body suit, but with the open back, the sleeves kept falling off my shoulder. Flashing was not part of the ensemble. Anyway, I changed into this chunky red jumper. You can kind of see the lumpiness under the skirt, but I love the colors together so much to care. The colors ARE great together! Ugh your bod makes me sick! It's like perfect! It's enough to drag me into the gym to do some body squats! The outfit looks great, and that jumper looks so soft!! The colors in your outfit are total eye candy. You look super chic and classy. Love all the colours, the shoes and the shape of the skirt! Those colors are perfect together!!! Love the skirt!! And I can't see the lumpiness from the shirt, the 2 pieces go great together!! You're so thoughtful in your clothes, I love it ! And you hair looks GORGEOUS. I love your hair styled like that and your bracelets are just beautiful! Great color combination and the shoes are awesome! I'm curious what hair color you used recently? It looks great in pictures! You look gorgeous! Love the color combination! I adore this color combination. Love those heels! You're wearing my favorite shade of blue! How can I not love this?!!??! your style is amazing !! 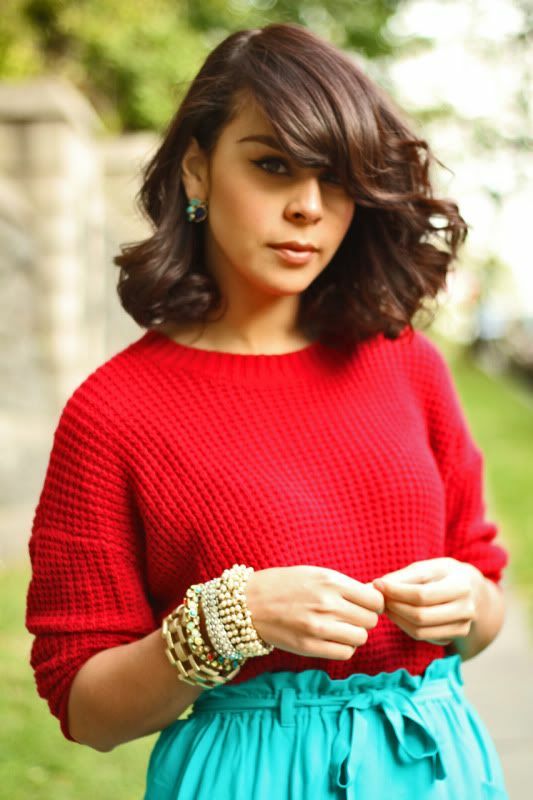 This look is stunning, the combination of the red and turquoise is FABULOUS!!! Excellent combination of colors! Beautiful footwear! Your hair and makeup always looks so amazing, you kill it! And cute color combo! I just love your hair, it curls in the perfect way. Btw. I have those giuseppe's they're so gorgeous. i would have never thought of this color combo but it look fantastic. i also love your shoes! this outfit is BRILLIANT. the colored gem bracelet especially pulls the whole thing together. love it! Love this colour combo - you look great! 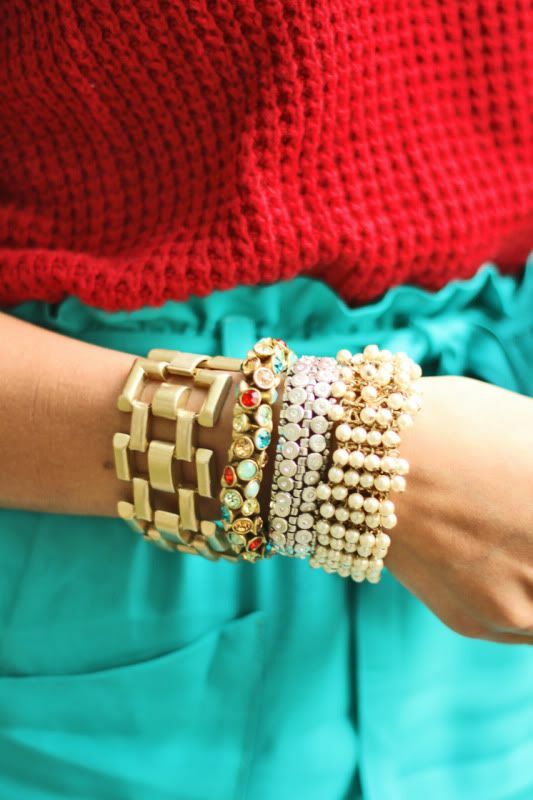 Love the way you accessorized this outfit, especially all those sparkly bracelets! Great color combination! Love those accessories as well! Sooo pretty! I love all those bracelets too! This look is to DIE for! I love your take on color blocking!! i love this combination of colors and the style of it just looks effort-less. How do you plan youre outfits, and where does the inspiration come from?? Love your outfit and the amazing color combination! Thanks for featuring our Carmella Stud Earrings, they pair perfectly with that skirt. The combo is amazing! You look great! WERK!!! Love the color combo!